Sonoma and Monterey County Search and Rescue teams continue to search for missing people days after the Camp Fire ripped through Paradise. THE NUMBER OF people missing in one of California’s deadliest wildfires soared to more than 600 yesterday as the remains of seven additional victims were found by rescuers. 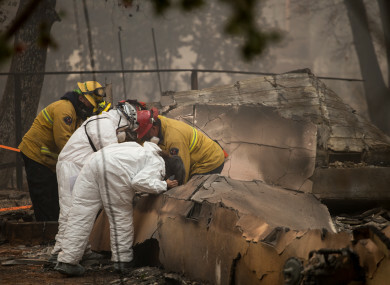 Authorities said the list of missing people had jumped from 300 to 631 during the day as investigators went back and reviewed emergency calls made when the so-called Camp Fire in northern California erupted on 8 November. “I want you to understand that the chaos we were dealing with was extraordinary” when the fire broke out, Butte County Sheriff Kory Honea told journalists, in explaining the staggering new toll of missing. President Donald Trump is set to visit the western state on Saturday to meet with victims of the wildfires, believed to be the deadliest and most destructive in the state’s history. “If you look at that list and see your name, or the name of a friend or loved one, please call to let us know,” he said. Investigators collected DNA samples from relatives to help identify victims as hundreds of rescue personnel and sniffer dogs worked to locate more victims yesterday. Authorities said a wanted felon was killed inside the evacuation zone yesterday following a high-speed chase with police. The man was wanted for a double homicide in 2014 and had been seen for three days camped out in his car. Virtually every home in Paradise, 130 kilometres north of the state capital Sacramento, was destroyed by the fire, which was driven by high winds. The 63 deaths reported from the Camp Fire make it the deadliest wildfire in California’s history, as the inferno also became the most destructive. The California fire department (Cal Fire) said that the Camp Fire has destroyed 56,655 hectares and was 40% contained. The Woolsey Fire has razed 39,660 hectares and has been 62% contained. It is expected to be fully contained by Monday. The complaint alleged that the fire began on 8 November when a high voltage transmission line failed, igniting tinder-dry vegetation. Email “California wildfires: 63 dead, more than 600 missing”. Feedback on “California wildfires: 63 dead, more than 600 missing”.